Done and done...and I mean done. 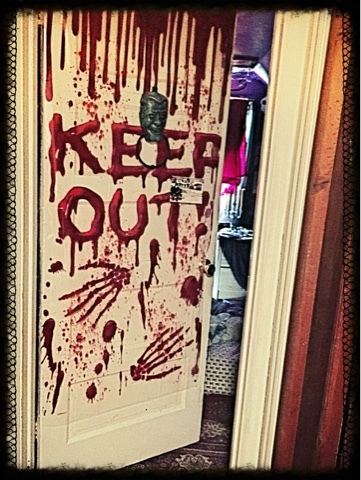 This is the door to the teenager's room where I'm house-sitting. Look carefully, you can see the candelabra in front of the window. On the ceiling is a poster of Bauhaus (of course there is). The message is unnecessary because I'm too creeped out to go in her room anyway. She's either a pagan, wiccan, or methodist. I can't remember.